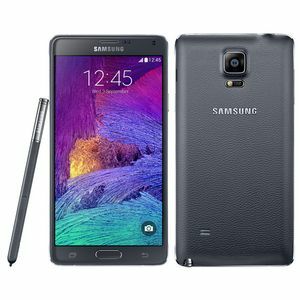 The Samsung Galaxy Note 4 is a high-end Android 'phablet', released in Q4 2014. It features an impressive 5.7" 1440 x 2560 QHD Super AMOLED display, 2.7Ghz quad-core processor, 3GB of RAM and 32GB internal storage. The Galaxy Note 4 shooter comes in at 16MP with optical image stabilisation and 4K video recording. The exterior features a faux leather texture backing and metal casing.